HISTORY OF SCHOOL FOOD RESCUE & SHARE TABLE GUIDELINES IN THE U.S. Note: This history is intended to document polices only, not participating schools. Many schools participated in school school food rescue programs prior to formal guidelines being written specifically for schools. The Michigan Department of Rural Agriculture and Development cited a USDA FNS 2012 Site Supervisor’s Guide for the Summer Food Service Program as a guide for Share Tables. According to K-12 Food Rescue student leaders in Michigan, standards for rescuing dairy, milk, and TCS (temperature controlled for safety) food items are still more stringent the the USDA guidelines for rescuing the same items. In June of 2015, the first state guidelines in the U.S. were written by the Indiana Department of Health and Indiana Department of Education for school food rescue policies for student "tray to trash" solutions via share tables and donations. Indiana became the first state to publish state guidelines in collaboration with Food Rescue. Great work by Green Umbrella with a document for Ohio, Kentucky, and Indiana. In May of 2016, Vermont became the 2nd state to school food rescue guidelines in collaboration with Food Rescue and using Indiana's guidelines for student tray to trash solutions via share tables and donations as a starting point. On September 16, 2015, the U.S. Department of Agriculture (USDA) and U.S. Environmental Protection Agency (EPA) announced the United States’ first-ever national food waste reduction goal, calling for a 50-percent reduction by 2030 (USDA News Release No. 0257.15). This student food waste audit guide is intended to help educate students about the amount of food they waste in their school cafeterias and to encourage them to reduce waste and eat more of the nutritious foods provided through USDA’s school meals programs or brought from home. New York Bill (S854) has been introduced and has passed the senate in the middle of 2016, directing various state agencies to write similar guidelines. The New York Assembly and Governor approval are still needed. In June of 2016, the USDA produced historic share table guidelines for K-12 schools, representing a fantastic step that should be the catalyst to end the practice of requiring students to feed landfills with unopened and unpeeled food from their trays that they choose not to eat. Even more stunning, the USDA allows certain unopened food served on the trays of students to be re-served though the lunch line if they place it on a "share table"and it goes uneaten. But more incredibly, it can be counted as a reimbursed meal from the National School Lunch Program. same food that some local and state health departments claim is not allowed to be donated to children and families in need via food pantries. Truth is often stranger than fiction! SFSP 15-2016 – The Use of Share Tables in Child Nutrition Programs. The Alaska Department of Environmental Conservation and the Alaska Department of Education & Early Development have collaborated on guidance for implementing food recovery at school-aged child nutrition programs including schools, outside school hour programs, and summer feeding programs. Washington School Food Share Program Toolkit. New Richmond Middle School brings back ‘Share Tables’ during lunch. Texas joined the fight in November of 2016: Texas has started its process with Food Rescue's Texas State Director of Student Leadership, 10yr old Yash Semlani, a 5th grader appointed by Mayor Turner as Houston's Inaugural Young Ambassador . Yash started the program in his school district and when he found that his state had no clear guideline like other states did, he started his effort with the Governor's office to get Texas to write guidelines for all districts to follow. He is also in contact with various ISD's who are implementing "share tables" in their districts. He is also supporting TX Rep. Diego Bernal for his HB367". The bill was approved and Hunger Free Texans produced a great school tool kit in September of 2017, featuring a photo from one our our national student leaders, Nick Iannone of Connecticut. Sadly, the North Carolina Public Health Department clarified in a December of 2016 memo that was distributed to many local health departments that only unserved food is allowed to be donated, mandating that unopened milk for example be fed to landfills instead of children and families in need in the community. 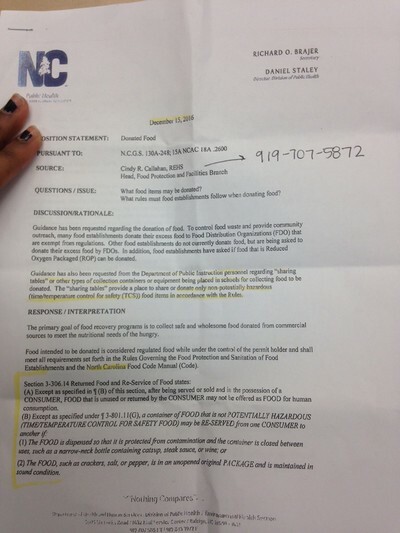 This clarification of policy can likely be attributed to the advocacy of a North Carolina High School student, Hanna Wondmagegn, who started a Food Rescue program in her high school, delivered a Ted Talk, and ultimately spoke to the school board, in the Charlotte Mecklenburg County school district, where she received a standing ovation. Shortly after Hanna began to pursue both district and state wide policy adoption of school food rescue policies, and her efforts were thwarted by the memo. Guidance has been requested regarding the donation of food. 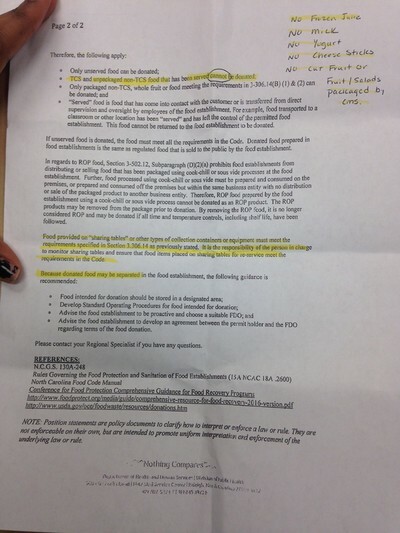 The Connecticut State Department of Education, after consulting with the Connecticut State Department of Health, sent out the following memo very similar to North Carolina, essentially leaving no path for TCS (Temperature Controlled for Safety) and PHF (Potentially Hazardous Food) to be donated, despite the USDA guidelines that lay out a path for such donations. In short, unopened milk or unpeeled whole apples served to students that they choose not to eat are required to be fed to landfills instead of children and families in need in the community. On Jan. 23 2017, Bill S.292 was referred to the Education Committee for review. 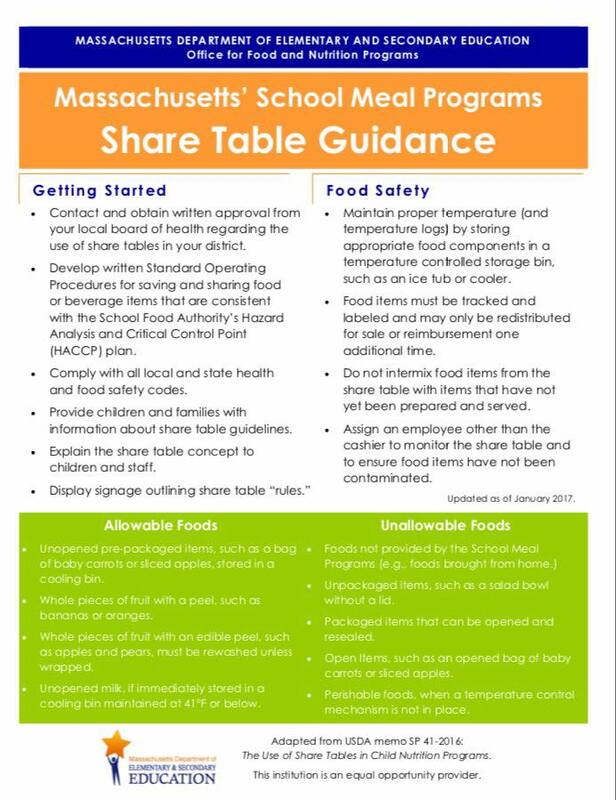 Shortly after, the Massachusetts Department of Education produced written guidelines for the safe use of Share Tables. Bill S.292 in Massachusetts: ​Bill S.292 SECTION 1. Chapter 69 of the General Laws is hereby amended by inserting after section 1C the following section:-: The board shall develop guidelines for the voluntary implementation by school districts of programs that encourage and facilitate the ability of school districts to donate excess, unconsumed, and edible food and beverages from meals served at such educational facilities to local food assistance programs including, but not limited to, community food pantries, soup kitchens, and other community and not-for-profit organizations that distribute food to the poor and disadvantaged. Such guidelines may include but are not limited to a methodology to provide information to educational institutions and local voluntary food assistance programs of the provisions of such guidelines, notification to educational institutions of their ability to elect to donate excess, unconsumed, and edible food and beverages to local voluntary food programs, and the provision of information and technical assistance on the manner of how to best donate excess food in a safe and sanitary manner. September 26th, 2017 Governor Brown signs law allowing schools to donate their unopened food from the trays of students. Meaning California schools are "allowed" to do what the USDA already says they can in chapter 5. Great work by Green Umbrella with a document for Ohio, Kentucky, and Indiana featuring the nation's first guidelines written by the Indiana Departments of Health and Education.